Delivered instantly to your smartphone or tablet! 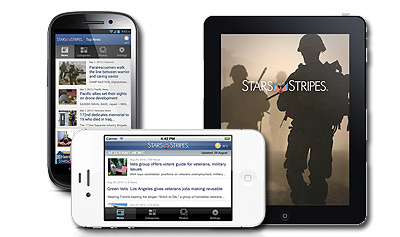 We deliver the military news that matters most, reporting independently from U.S. bases all over the world. Keep in step with the "military beat" from the only independent DOD news organization with its boots on the ground! Get the Tablet Edition for iPad®: Preview for 7 days at absolutely no cost. Subscribe for only $3.99 per month! Pay only $39.99 for a year and get two months free! We also have smartphone apps for the Apple® iPhone and for Android® — only $.99 each.